Amazing Estate of Artist and #1 NY Times Best Selling Author Victor Ostrovsky and Tobie Ward! Address: This sale has concluded. Thank you to all who attended. Directions: Enter the Regal Development off of Mountain View Road. There will be a person there allowing you access through the gate. Also, Please park on the house side of the street only and maintain fire access. Do Not Block driveways. Thank You. Everything must be sold including all home furnishings, decor and all prints, sketches and artwork. 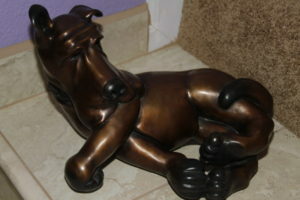 Some exceptions apply with bronze sculptures and original paintings. Victor is a #1 New York Times Best Selling Author of “By Way of Deception”, “The Other Side of Deception”, and the novel “Treason with Valor”. Signed copies will be available at the sale. Read more about Victor Ostrovsky here. Not only is this an incredibly packed and gorgeous estate full of fine furnishings, decor and unique items, but it is an amazing art gallery. 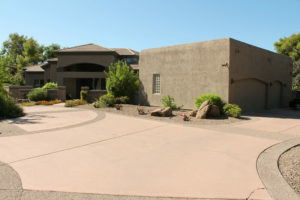 Expect to find their personal collection of original artwork, including sculptures and paintings. A large number of incredible sculptures by Richard Guino will be available for purchase. Victor is a personal friend of the Guino Family. All bronze, terracotta, and metal art are original pieces from the Estate of the Guino Family and are part of Victor’s personal collection. In addition to this all bronze pieces were part of the Pierre-Auguste Renoir Richard Guino Exposition in Monaco France and The Renoir Guino Grand Exposition in Scottsdale Arizona by Emmanuel Javogue Fine Arts, LLC and Ostrovsky Fine Art in 2005. All of these pieces were brought over from France by the Guino Family, including Michel Guino, and Emmanuel Jovogue for Victor’s collection. Victor’s collection also includes the powerful and amazing metal sculptures of Richard’s son, Michel Guino. All of these pieces were also brought over from France via the Guino Family, including Michel Guino, and Emmanuel Jovogue. PLEASE NOTE: Cash or wire transfer only for larger purchases. Everything is priced to sell at a small fraction of gallery prices and this is an amazing opportunity to acquire some amazing artwork for your collection and enjoyment. We have artwork for all budgets from original paintings to giclee prints to lucite sculptures, and a whole lot more! The Richard Guino Renoir bronze and Terracotta Sculptures are special to Victor as he is good friends with the Guino Family and acquired these pieces as an investment. 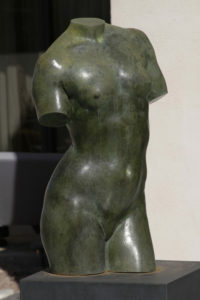 The largest life size bronze is titled Buste de la vendangeuse 1913 signed edition 1/8 with the foundry mark near the base. This is priced at $55,000. This is Victor’s favorite bronze and he paid substantially more when he acquired it and is being sold with a custom metal base on which it stands. The other pieces are much smaller and priced well below what they might bring at high end auction. Again his artwork, and all of the artwork for that matter, is priced well below gallery pricing and is priced to sell. You will also find unique art from numerous other artists and of course a large home full of furnishings, decor and furniture pieces. To start there are hundreds of original paintings and sketches from Victor Ostrovsky which are part of his personal collection. Also, there are many original mixed media paintings from the late Bella Ostrovsky-some truly amazing pieces. You will also find some incredible abstract paintings and sculptures from Tobie Ward. Her ability to tap into divine feminine energy transcends the art in which she creates.. So. Wondering about the household items? There are lots here. Starting in the kitchen you will find lots of decorative dishware, including decorative Romero Britto Teapot Hearts and a nice set of hand painted coffee cups. Victor has even produced an imprinted tile with his artwork for a nice kitchen hot plate. There are some great appliances as well, including a Keurig Hot coffee maker and a nice toaster oven. There are also Lenox Federal Platinum Bakeware and a set of Nieman Marcus Anniversary Plates. There is also a nice set of Limoges Symphonie Platine Plates, a great All Clad Roaster, and many other pots and pans from Martha Stewart to Cuisinart, including a toaster, ice cream maker in stainless steel, food processor, and many other kitchen appliances, kitchen tools, kitchen furnishings, décor and much more. In the family room there are Crate & Barrel chairs, and a great futon with Tan Faux Leather Cover. There are also lots of books from art books to non-fiction books. There are even some signed gems in here. You will find lots of décor as well including a great pair of marble Foo Dogs and a lot of small décor and art work. There are numerous lamps from table lamps to floor lamps. There is of course a lot of unique art pieces here as well. There are some terrific barstools and a nice well used Ethan Allan large desk-used for creating and working on art pieces. This area continues with a light distressed wood set of nesting tables and a great glass topped kitchen table with decorative metal base and chairs. Continue into the living room and you will be greeted with a nice bar and four leather bar chairs. Here you will not only find some fun bar tools and bar ware, but some of Victor Ostrovsky’s collection of artwork. The Top Shelf giclée print above the bar is a great talking piece. The living room also is loaded with furniture and artwork in every direction, form many of the original Richard Guino bronze sculptures to many unique art pieces from various artists including Bella, Victor and Tobie. There are also accent furniture pieces, lamps and tables. There are many accent chairs from reds to greens, to black and gray. There are also many black leather couches and chairs. Near the front of the room you will find a magnificent Lucite imbedded sculpture on a black pedestal stand-truly outstanding. There was even a wright up on some of Victor’s work, including a similar Lucite Sculpture in Phoenix Home and Garden Magazine. Throughout the rest of the home there are bedroom and office furnishings from Ethan Allan, Stanley Furniture and a lot of accent tables, lamps and furnishings. You will also find many flat screen TVs, iPod accessories. In the office you will find a Mahogany leather topped executive desk and leather and wood office chairs. It was at this desk Victor wrote two of his books. There is even a 6-foot-tall butler with adjustable extremities. There is even an amazing original acrylic painting by Victor Ostrovsky spanning most of one wall. The bedrooms are loaded with lamps, flat screens, décor and of course more art work. There is so much original and gallery quality artwork here that, in addition to being displayed throughout the house, we have two rooms dedicated to organizing hundreds of pieces of beautiful artwork from originals to large wall giclée panels. The patio is also full starting with black rattan sectional with cushions, chairs and metal and wrought iron furniture pieces. In the yard and patio, you will find a lot of magnificent Michel Guino welded metal art pieces, most made from WWI plane parts and shell casings from the military. 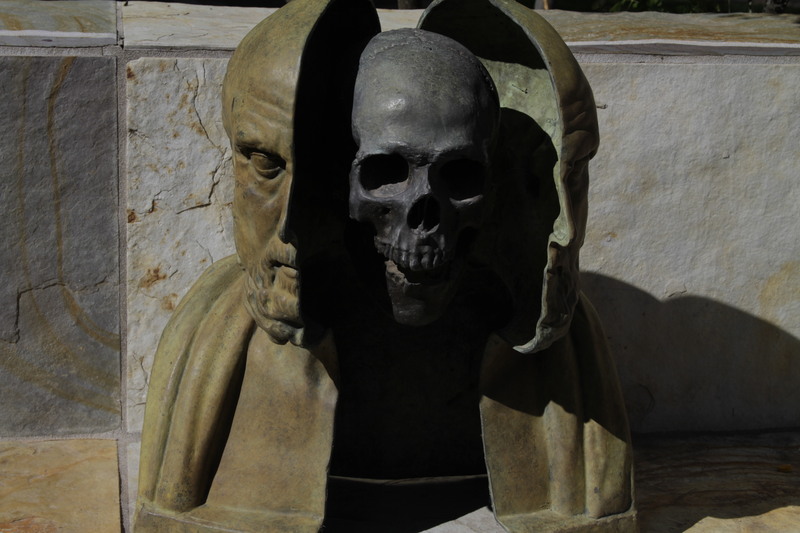 He of course is a magnificent sculptor as well and produced one of my favorite bronze pieces with the split face and the scull in the middle. There are also lots of plants and other cool and interesting patio décor. The garage is also loaded with art tools, work benches, easels, hand and power tools, bikes, and a whole lot more. There is even a nice Whirlpool washer and dryer.